MEASUREMENTS: USB Cable Extension with Ethernet Cables - does it worsen jitter? I mentioned in my "look at the sound room" post the other day that in the Emotiva XSP-1's multichannel "HT Bypass" mode, I'm dealing with some noise when the USB DAC (TEAC UD-501) is connected. In an attempt to fix the problem, I've tried a number of ways to minimize the problem - different USB ports on the motherboard, USB3 vs. USB2 ports, different USB cables, ferrite cores attached to the USB cables, even put in a USB3 PCI-E card... I've even dissected an old USB cable to disconnect the 5V line but it looks like the TEAC needs this present. All to no avail - the high pitched whine and buzz continued. It includes a transmitter (computer end) and receiver (TEAC DAC end). The transmitter side will use the computer's 5V rail and a standard 5V power supply in the plastic bag is used on the DAC side - this of course isolates the power from the computer to the DAC. It also comes with a short USB A-A male cable for the USB connection from the computer to the "transmission" unit. Notice the 5V power connector on the unit to the left for the receiving device end. Total cost was ~$60 for the set including shipping from Asia. The unit is capable of 100m (~300ft) transmission distance and specifically rated up to the 480Mbps high speed spec. Unfortunately I don't see an easy way to crack open the little boxes to see what's inside and I figure I didn't want to risk breaking them at this point. Set up was easy and intuitive since there's barely any English in the instruction pamphlet. Plug 'n' play, no drivers to mess around with at all. So... Did they work for my purpose? Yeah... To some extent. They did definitely filter out the "computer noise". I can no longer hear the beeps and buzzes when the computer accesses the hard drive or when the CPU is busy processing. 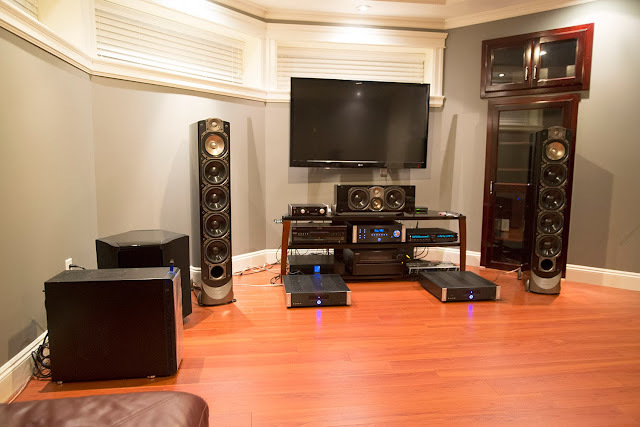 Unfortunately the high-pitched whine is still audible when I stand against the speakers; but much reduced - maybe 25% of previous and almost inaudible at my listening position about 9-10' away (ambient background noise is very low in my basement sound room). I tried different Cat5e and USB cables but this didn't make much different. The next time I go to the computer store, I'll see about getting Cat6a STP (Shielded Twisted Pair) cables and maybe shorter 3ft USBs to minimize any potential to pick up interference... I doubt this will make a difference however because I suspect the noise is embedded in the signal from the computer itself rather than picked up due to lack of shielding. For the direct USB situation, I used a 12' generic shielded USB cable (similar in build to the Belkin Gold USB cable) direct from the Win8 HTPC --> TEAC UD-501. Notice how rather "unfair" this setup is for my needs... In real life I only use a 6' run of Cat5e cable, but to exacerbate any issues, I'm using a 50' run of just generic ethernet cable. Notice how there's no difference whether it's a direct USB cable or the much more complicated USB-Cat5e extender setup. 16/44 as usual measures perfectly and there's not even a hint of loss in dynamic range, worsened noise, or excess distortion using the Cat5e hardware! How about the dreaded jitter? As usual, let's fire up the spectrum analyzer and have a look at the Dunn J-Test output off the TEAC DAC. Yet again - essentially no difference. Okay, short and sweet - using a USB cable extender with a Cat5e system like this one does not degrade the audio output from the asynchronous TEAC UD-501 DAC. Even measured at a length of 50 feet (much more than my needs), there's no problem. I had a listen last night with some hi-res stereo 24/192 material - John Coltrane's Blue Train Classic Records 2001 HDAD, Neil Young Harvest off the 2002 DVD-A. 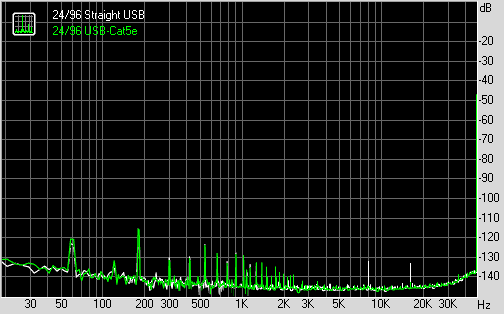 Also had a listen to some DSD128 - samples from 2L's website. As usual they sounded very good off the TEAC. All the precision I had come to expect from the TEAC with standard USB cabling was there with no hint of resolution loss or evidence of digital error. Basically, I'm stumped when I read comments on places like Audio Asylum by audiophile "audio engineer" folks who claim that even adding a ferrite core to a USB cable will do terrible things like worsen jitter (supposedly audible!). As far as I can tell, these folks also never seem to throw up a few measurements or describe what method they use to come to such a conclusion... Even if doing this worsened the sound quality, why do they blame jitter as the problem? As far as I can tell, bits are bits; at least with a decent asynchronous DAC (I suppose there could be problems with old adaptive isochronous units). Asynchronous USB protocols like the one used with the TEAC work as they should to clean up any stray timing errors so long as the buffer isn't over run and the data is "bit perfect" (easily verifiable with a USB hard drive attached and looking for data corruption). Hard to imagine than anyone needs more than a decent (inexpensive) USB cable for quality sound if doing this kind of cable extension doesn't lead to sonic degradation. I do believe that there are many mysteries in this universe outside of the science we understand today, but digital reproduction in the audible spectrum doesn't need to be one of these! As usual, feel free to provide a link to some results if there's evidence to suggest I'm incorrect. So, I headed off to the local computer store earlier this morning and bought some 50ft Cat6a STP (shielded) ethernet cables to try. I figure if this doesn't make a difference, the higher quality cable can be used for longer runs around the house. Surprise! It worked... The whine is now gone. The analogue "HT Bypass" is still a bit noisier than straight balanced cable into the Emotiva XSP-1 preamp but at least there's absolutely no high-pitched noise audible with ears right up to the speakers now. 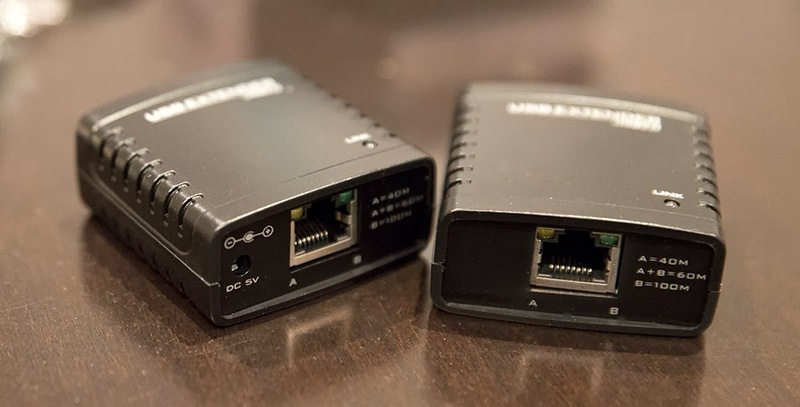 At least for me, it looks like the use of one of these high-speed ethernet cable extenders is a good option to try for those suffering from USB-related noise in the audio system with no evidence of signal degradation (including jitter with an asynchronous DAC). As I opened boxes and put things into place after the recent house move, I pondered about the living room situation. I have a decent sized 46" LCD/LED TV there, my old Denon AVR-3802 receiver, the Squeezebox Touch, and a couple of old Tannoy MX2 bookshelf speakers. 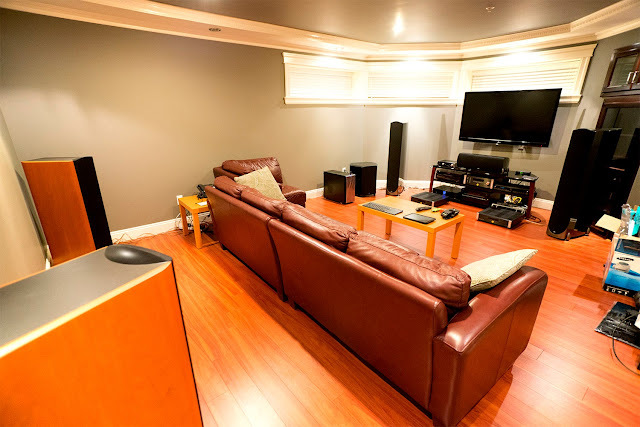 It's also where I will have the game machines - the good old XBOX 360 and Wii from a few years back mainly for the kids and the odd Kinect dancing game when friends come over :-). Looking back, I basically grew up with computing technology... My first computer was the 5KB VIC-20, then Commodore 64, then Commodore Amiga before jumping over to the PC world in the mid-90's putting together my first PC in the venerable AT form factor. All along, games were the programs that truly utilized the computing power of the machines whether it was through hand-entering games published in the old Compute! magazine or being blown away when I first saw the "smooth" character and parallax animations in the Amiga game Shadow Of The Beast! Unless you're using the machine for frequent graphics rendering, or maybe folding, it's probably a safe bet to assume that it's the gaming software and the virtual worlds they create that will reveal the true power of the machine. I suspect one thing that is changing for me since having kids a few years ago is just the time available for gaming (among other hobbies like audiophilia!). The push I see in this generation of gaming is that of extending the "social" experience. The opportunity to see what friends are doing, which games they're playing, sharing gameplay videos, and of course the ability to play online at the same time. I think that's cool and certainly for those who are looking for that experience, there's probably no better than the unified system that XBOX Live (which I used to subscribe to) and PlayStation Network have available (I've never tried Nintendo Network). I don't know about you guys, but I'm feeling a bit of "Social Network Fatigue" (SNF) these days though... From the barrage of E-mails, phone texts, to FaceBook notifications, to LinkedIn, to Twitter tweets; I think I'm "good". Friends know how to contact me and I them... I'm not sure I need yet another network to join; especially one which is fee-based subscription and forces people to choose "sides" based on hardware preferences which is ultimately about securing financial revenue (isn't it always? here's a cute South Park take). Certainly you know this was what Microsoft must have been thinking when it first announced that the XBOX One had to be online for gameplay and also threatened to prevent the sale of used games early on. Thankfully, they later retracted this policy. So, if we take a step back from the whole social gaming scene, what do we have left? The same thing as we've always had... Competing hardware platforms trying to provide the best interactive entertainment content either through inherent hardware superiority or exclusive games. And this is where I'm quite hesitant to buy in at this point. For those who haven't read up on it, here are the technical stats: IGN Comparison and this from ExtremeTech. In this generation, AMD's Radeon GCN rules in the graphics department. Every one of these machines is based on this internal graphics architecture which allows a much easier comparison of the graphical prowess. And in the graphics department, without dispute the PS4 is king. If one's priority is the potential to create the most detailed, smoothest gaming experience, then PS4 is the winner - especially that unified 8GB of GDDR5 RAM has thus far not been done and promises some amazing speed and texture quality. Already, with multiplatform 1st generation games like Battlefield 4, this has proven to be the case. Nintendo always seems to march to its own drummer and this is no different with the Wii U; it really cannot compete based on graphics hardware, and as always, must depend on first party titles (talk about proprietary hardware, the disc drive can't even play Blu-Ray movies for crying out loud!). As for the CPU in these machines, it's very hard to get excited about those 8 AMD Jaguar cores in both the XBOX One and PS4 (the Wii U's PowerPC CPU a.k.a. Espresso is considerably weaker). Speculation is that already the OS is large with a couple of CPU cores unavailable for gaming use in both the PS4 and XBOX One. As to whether this might be a significant limiting factor to the gaming experience, I guess we'll just have to see (the Jaguar CPU core in Kabini is significantly slower than the Trinity core in the A10-5800 APU I've been running for about a year in my HTPC). Obviously offloading tasks to GPGPU streams can alleviate some of the CPU burden but it remains to be seen how this might also hinder the graphics horsepower. Of course, currently we're only able to review first-generation games and as we have seen in previous console generations, things will only get better in time. With a specific target hardware, custom OS and APIs that can access abilities "closer to the metal", a lot of power can be squeezed out in optimizations. However, I suspect that since the XBOX One and PS4 are based on hardware already in existence in graphics cards for a couple years (GCN has been out since January 2012), the estimates of computing horsepower should be quite accurate and the familiar architecture will lead to optimizations sooner than something like what we saw for the PS3 and its unique "Cell" processor. Furthermore, I speculate that much of the programming optimizations probably will benefit across platforms due to these inherent hardware similarities, multi-core CPU optimizations should become standard for example. As you can probably tell based on the tone of this post, I think I'm just going to wait on getting a game machine... 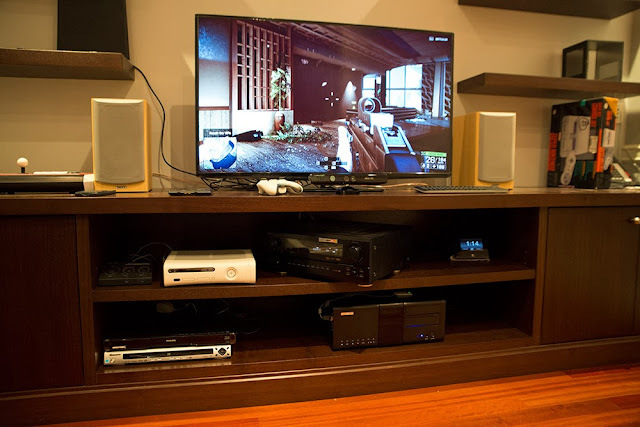 Looking around here, I already have a number of pieces I can use... An old Silverstone Lascala LC14 case, 500W power supply, Blu-Ray SATA reader, XBOX 360 wireless controller receiver, nVidia GTX 570 from 2011 (still able to play a mean game of Battlefield 4 at 1080P)... On sale I got an AMD FX-8320 + 8G RAM + motherboard + HDD for <$350. Enough to put together a decent gaming rig for the living room which doubles as a general machine for fast NetFlix, streaming video playback off the NAS, etc. I've already got a few older games like StarCraft II, Battlefield 3 and Street Fighter IV which could be fun in the living room and maybe try out a few game downloads off Steam over the holidays. Heck, I might even go online to have a look (I think Battlefield 4 can handle up to 64-players). Another nice thing about PC gaming is compatibility with older titles numbering in the thousands; not to mention using emulators to run those old nostalgic ROMs I grew up to love (hey, my son loves Pacman). One thing I wish could be done easily would be to use the PS4's DualShock4 in a PC game machine; I love the feel of that controller. The Steam Controller looks interesting (probably released in 2014) - for now, I'm quite happy using the XBOX 360 remote controllers. Till next time... Enjoy the tunes and games :-). [Update Dec. 29, 2013]: I just watched the documentary Indie Game: The Movie. Wonderful snapshot into the world of independent gaming! I really enjoyed the quirky Super Meat Boy a couple years ago :-). It's about 2 weeks now since I moved into the new home. As expected, it was stressful; with kids in tow, it's not like the bachelor days with just one's personal belonging in the trunk of my old hatchback! Head on view of the main system - Transporter playing. Angled from the side - note the SUB1 just lateral to the left front speaker. The black box closest to edge of the sofa is the computer (Fractal Design Define XL case - nice and quiet). "Super deformed" wide angle view of the room... Rear Paradigm Studio 80s visible. As a MUSINGS post, I'm just going to spend a few words on thoughts around building the setup. 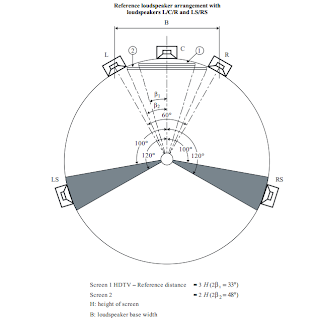 Since the start of this blog and explored briefly in this early post, I do believe that judging the quality of an audio component can be accomplished objectively; that is, there is a technically "good" or "bad" way to know whether components live up to engineered goals. 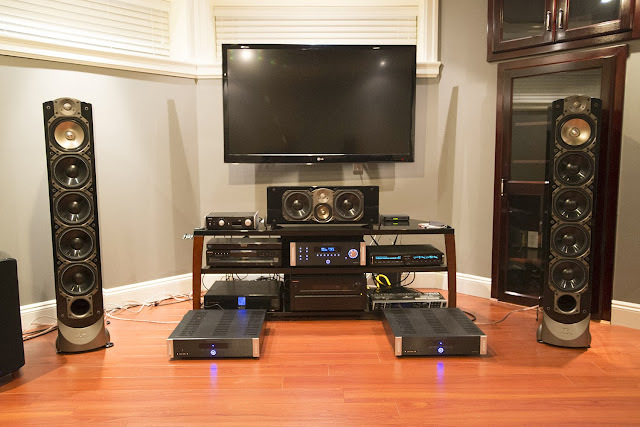 As I mused in that post, the gold standard for me is not so much to reproduce the "concert experience" as some might desire, but rather the ability of the equipment to reproduce exactly what's on the CD/DVD/DVD-A/SACD/Blu-Ray - that is my definition of high-fidelity. If the CD has an ability to transport me to a faraway concert hall, then I want my equipment to be able to reproduce that encoded sensory stimulus which leads to (hopefully) my ability to experience the same. Of course, not all CD/DVD/DVD-A/SACD/Blu-Ray's can do this! The medium itself must be able to encode quality to the extent that the experience is possible and the experience itself is provided by the artist, recording engineer, mixer, mastering engineer, producer, etc... who have put their expertise and knowledge into the recording. On my (consumer) end, I'm just looking for a good enough combination of components that can take that encoded sensory experience and provide it accurately; nothing more. I do not personally believe in aiming for a "euphonic" setup where the components can make all albums sound "sweet". 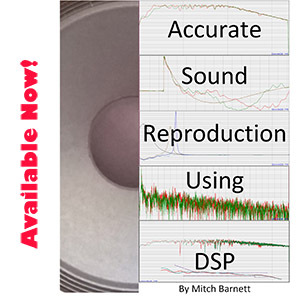 I'm interested in just an honest presentation of what is on the disk; if I want to add euphonia, I will happily do it myself such as the PCM-to-DSD upsampling process or re-EQ with my Behringer DEQ2496. Alright, I'm pretty happy with those numbers - I think they reflect reasonably well my priorities. Of course, the cost that truly trumps everything is the cost of real estate in Vancouver! So, let's run over the components I have set up in the room and share a few thoughts... As usual, since this is a MUSINGS post, it's mainly an experiential discussion with opinions thrown in. Most of my music is in stereo. Therefore good 2-channel reproduction is most important. Enough said. Time and again, measurements of the ASUS Essence One, Transporter, and TEAC UD-501 have demonstrated the superiority of balanced cabling. Whether anyone can hear the difference of course is another issue. Balanced operation was the reason for the choice of the Emotive XSP-1 preamp as the heart of the 2-channel system. To maintain the balanced topology, I got a couple of Emotiva XPA-1L monoblock amplifiers - good price and with the option to switch over to 35W Class A bias if I want. Although just "fast ethernet" (100Mbps) is all that's required for the Transporter, the house is wired for gigabit and I've used generic Cat-6 cables for the Transporter to the gigabit switch. I'm quite pleased that I can easily transfer >100MB/s between machines around the home. All balanced audio cables were inexpensive (but good build) Monoprice Premier XLR's from 3-6' in length. Over the months, I've used Monoprice cables to measure balanced output from my DACs and the results have been excellent, not unexpectedly. 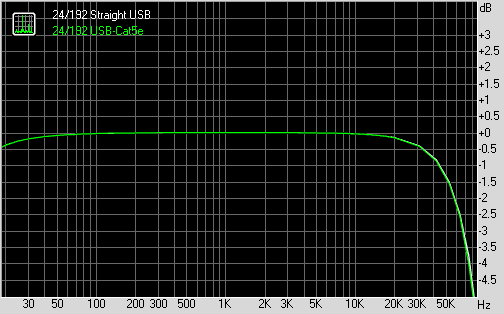 In the same vein, speaker cables are Monoprice 12-guage "Enhanced Loud" (LOL!) OFC. 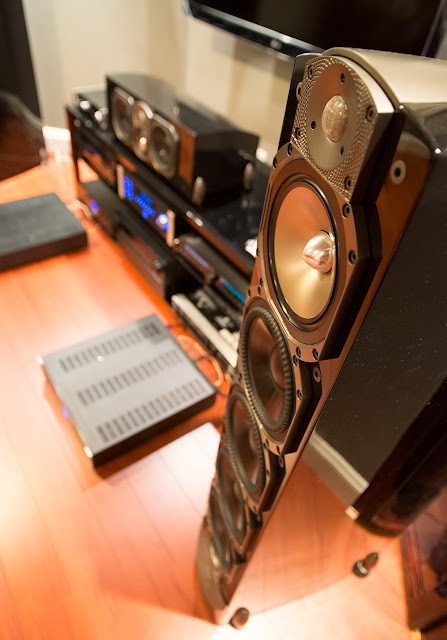 Monoblock to front speakers only 4', center channel 6', rears at most 25'; cut to minimum lengths required. I bought a 100' spool for $30 and still have some left. I love multichannel music! The realism achievable can be amazing and IMO anything that enhances the creative potential of artists can't be a bad thing. 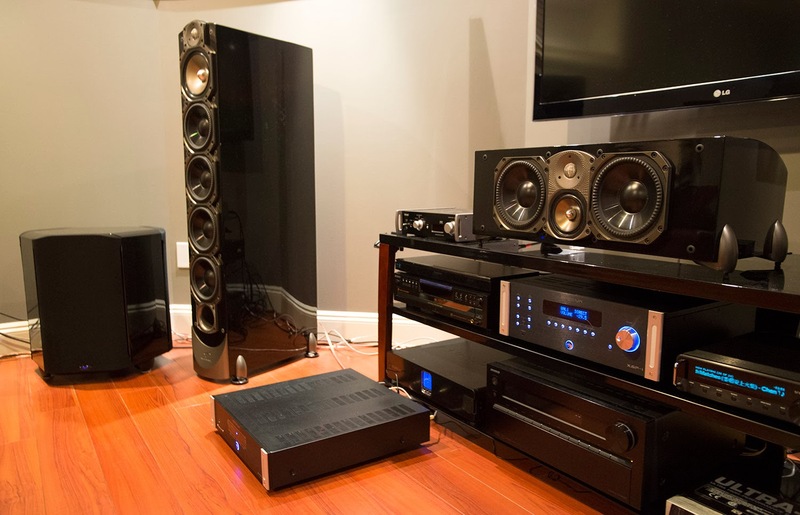 Remember that historically multichannel speaker configurations were being explored along side 2-channel stereo. 3-channel stereophonic sound was demonstrated by Bell back in 1933 and the right-center-left "3.0" arrangement was used in some of the earliest "Fantasound" systems for Disney's Fantasia when released back in 1940. Having a center speaker in a theater setting allows the anchoring of front-and-center sound which improves the imaging for those not sitting precisely in the "sweet spot". For music, likewise it helps especially for solo/vocal tracks. For example, the Analogue Productions' Nat "King" Cole SACDs like The Very Thought Of You presented in 3.0 sounds phenomenal with this arrangement with Nat sounding like he's right in front of you crooning. I suppose I have room for a full 7.1 surround setup with 2 extra speakers to either side using the Onkyo receiver... Another SUB1 for 5.2 or 7.2 would give insane bass! One of many projects for the future, I suppose. I am unaware of any music I want available in 7.1 at this time and I suspect a TV upgrade to something like 80" would be more likely. In a moderately complex setup, it's not surprising to find some challenges along the way. The main thing I found was that for multichannel, the Home Theater Bypass setting on the XSP-1 was very sensitive to noise. I had to move the PC to the left side about a foot from the subwoofer and ~5' from the XSP-1 to get rid of RF noise picked up by the preamp. Also, I had to use a "cheater plug" for the LG 55" HDTV mounted against the wall to remove ground loop noise. This was the relatively easy stuff! The most difficult noise issue I'm still dealing with now is the USB interface to the TEAC UD-501. If I have the USB cable connected, there's a high pitched whine emanating in HT Bypass mode. This does not appear to be a component ground loop issue but rather noise from the PC through the USB interface polluting the analogue pass-thru. This actually does not affect stereo playback from the TEAC, just when I'm in multi-channel mode with the XSP-1 passing through the front stereo and subwoofer channels. It's not an issue with the RCA cables since more expensive AudioQuest and Tributaries RCA cables make no difference compared to inexpensive Radio Shacks whether 3' or 6'. The simple solution for now is unplugging the USB cable to the TEAC DAC when I'm listening to multichannel. 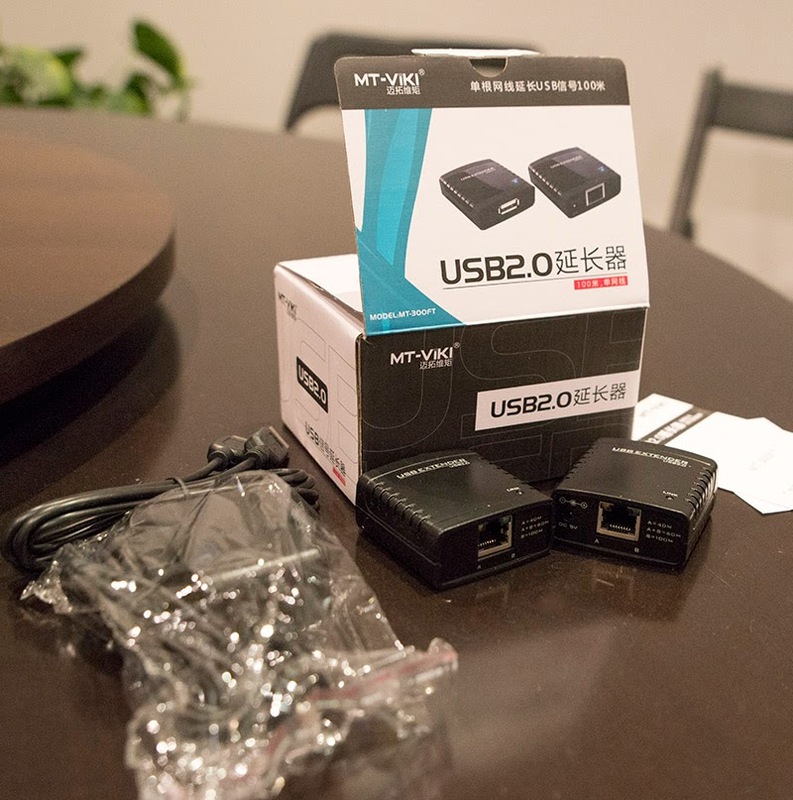 Trying other USB ports and hubs have so far not helped. I'll have to look at other options like the FireStone GreenKey "USB Isolator" or some other way to achieve galvanic isolation but maintain high-speed USB 2.0 for DSD and hi-res PCM playback. Looking ahead, I still have to try out some frequency response measurements and subwoofer room correction with the Paradigm PBK-1 ("Perfect Bass Kit") I bought (only ~$120). I'm inspired by Mitch's experiments with Acourate so may look into that too... The room is still bare and resonant so things should also improve when the rug comes and in time, perhaps some acoustic paneling and bass traps. Not to mention some clean up and better cable management! I've played around with the Class A/B vs. A settings on the Emotiva XPA-1L. Realistically I doubt I will need much beyond 30W of power through the efficient S8 speakers so I expect the amps will remain well within the 35W Class A limit (these are 250W monoblocks in A/B). So far, I cannot say I hear much of a difference although I have not specifically done any "serious" listening in Class A mode yet. It certainly does get quite warm (somewhat uncomfortable to touch) after an hour in Class A mode - as expected. Makes for decent space heaters through the holidays I guess :-). I thought I'd end off with a couple of recommendations for multichannel lovers; both of these titles are only available as DTS-CDs from the early 2000's. I've since ripped these disks and converted to 5.1 16/44 FLAC with the DTS plugin for foobar2000. - Lyle Lovett - Joshua Judges Ruth (2002 DTS release): Folks, this is a great example of what a good multichannel mix sounds like. Lyle's voice is mostly centered up front, good use of surrounds for ambiance, some discreet vocals in the rear tastefully done. 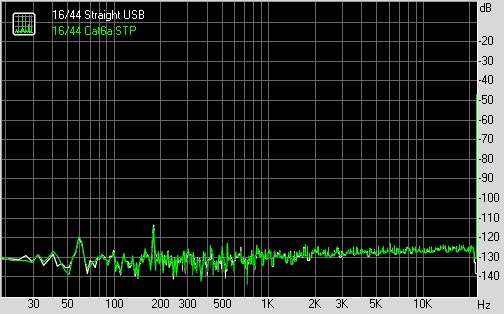 Great dynamic range of DR16. I've always enjoyed the track Church from this album (and used it as a test track for the old MP3 test). In the multichannel version, you literally feel immersed in the choir when they start singing! It's unfortunate that a proper DVD-A/SACD was not released for this album given how good this sounds (already in the DTS-CD incarnation, this album puts to shame many DVD-A and SACD multichannel releases). - Alan Parsons - On Air (1996 DTS release): Hey, it's Alan Parsons who knows a thing or two about good sounding audio... Progressive rock was made for multichannel - especially so when conceived from the start for surround sound. Rear channels utilized aggressively on some tracks along with birds singing, and cool jet flyby special effects (check out the first track Blue Blue Sky). Again, a multichannel DVD-A/SACD release would have been phenomenal. Until next time... Enjoy the tunes, wishing you and yours a wonderful Christmas & New Year season.